Chessa Adsit-Morris and Nick Elson were crowned not only Canadian but also NACAC Champions at this past weekend's mountain running championships in Vancouver, BC. Both received the Jim Clampett Award which is awarded to the top overall male and female in the Canadian Championships. At today�s NACAC Mountain Running Championships at Cypress Mountain, host country Canada swept the top four places in the men�s race and also placed their top woman in gold-medal position. However, the U.S. women kept their streak alive to again win team gold. The Canadian men finished all four of their team members, before the first U.S. runner crossed the line therefore creating a sweep of the podium and gold for Team Canada. Second for Team Canada was Kristopher Swanson in 55:32, and in third Shaun Stephens-Whale in 56:30. Josh Eberly was first for Team USA in fifth overall timed in 57:29. Close behind was fellow team member Ryan Woods in 57:42, and Jordan Chavez in 1:00:08 to round out the scoring. Adsit-Morris clocked a 1:06:56 and was followed 16 seconds later by top U.S. runner Megan Roche who led her team to gold. In third was second U.S. runner and 2013 World Mountain Running junior champion Mandy Ortiz in 1:08:16, followed by Canada�s Sarah Bergeron-Larouche in fourth in 1:09:01. Megan Lizotte finished fifth for Team USA timed in 1:09:51, to round out the top three scoring members of Team USA with 10 points, just one point ahead of Team Canada. USA team leader Richard Bolt echoed Lambert�s thoughts on the weather, �The sunny, warm weather was a big improvement over 2012 when we had cold, rain, and foggy conditions at the same location at the same time of year. Nancy Hobbs represented the WMRA, and Bill Roe, USATF Long Distance Running chairperson was also on site at the event. The women�s team boasts four athletes who have all finished in the top 60 at the World Mountain Running Championships. Meggan Franks and Sarah Bergeron-Larouche both finished in the top 50 at the 2013 World Mountain Running Championships in Poland. Meggan ran 17:42 for 5k earlier this year after taking a break from competitive running in 2014 to have a baby. Sarah is the reigning World Snowshoe Champion in the 10k distance. Catrin finished 51st at the 2012 World Mountain Running Championships in Italy and won this year�s Canadian Long Distance Mountain Running Championships. Chessa Adsit-Morris was the top Canadian (57th) at last year�s World Mountain Running Championships in Italy. The men�s team includes a mix of Canadian national team veterans and newcomers to the team. Kris Swanson is the most experienced mountain runner on this year�s squad for men or women. He competed at the World Mountain Running Championships in six of the last seven years and has a best finish of 30th place from the 2010 World Mountain Running Championships in Slovenia. 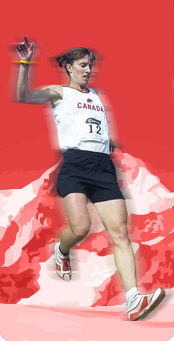 Shaun Stephens-Whale boasts an even longer connection to the national team, having represented Canada as a junior in 2006 and more recently, represent Canada last year at the World Mountain Running Championships in Italy. Olivier Babineau was 10th at the national championships last year and won the 22km event at the Mt. Sutton Xtrail race in Quebec. He was 9th at the World Snowshoe Championships earlier this year. Nick Elson was the Canadian Champion in the Long Distance Mountain Running course last year in Revelstoke, BC and boasts a season�s best of 31:58 for 10k. The national team shared their thoughts on competing on home soil on a tough course.